Swimming is almost dull in that to swim faster you need to repeat with great accuracy the same movements repeatedly. The pathways, the same degrees, the same movements at the joints. Timing, breathing patterns, the number of leg kicks. If anything ‘fades’ in terms of no longer holding the same distance travelled with each movement then we slow down. You don’t need to be strong to swim fast but you need the strength to repeat similar movements repeatedly so that you swim a decent speed for longer. A good example of this is when a client comes for a swim analysis and they ask if I think they might be able to swim 1500m in under 25mins. If I watch them swim 25m in 25secs then I offer that at the moment they can swim at the necessary pace required which amazes them but then comes the hard bit. Repeating that pace for 100m, then 200m,400m etc.Due to water being so much denser then air you cannot battle water with strength and fitness alone. You need technique and a kind of endurance that allows repeated movements over and over without creating too much drag or needing too much energy (i.e. when the wrong muscles are employed to drive the stroke. 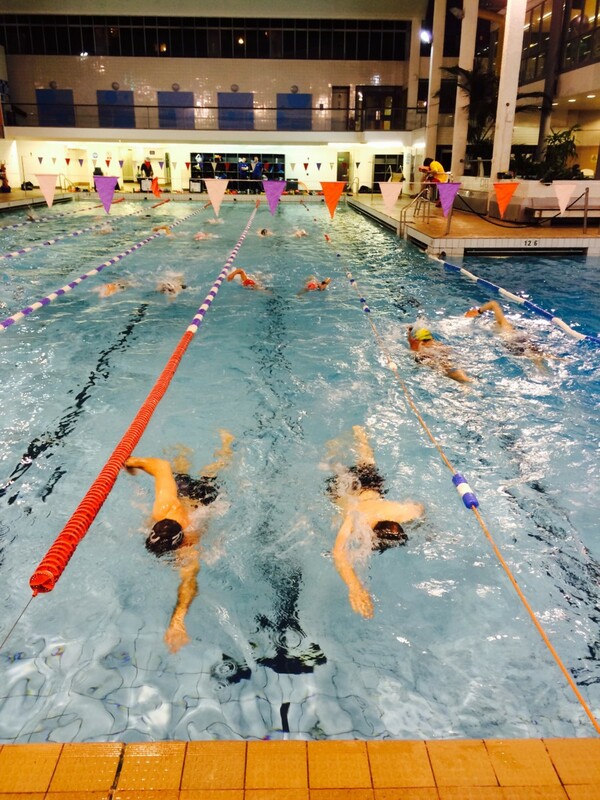 The following are 3 of my favourite endurance focused sessions to be performed in a 25m pool. Try one a week for 3 weeks at the Novice distances, then a repeated 3 week cycle at the Intermediate level and finally the advanced for 3 weeks. In conjunction with some pure technical work across 2-3 additional swims each week these will really help you handle swimming strong speeds for longer distances. Perform a 15-20min warm up ahead of these sessions and spend 5-10mins cooling down after you have completed these sets. Try some Arms folded Kick or Glute Kick off each wall to wake up the legs in the warm up. BP refers to breathing pattern. BP2 means every 2nd stroke to a single side. BP3 means an alternating every 3rd to both sides. TEACHING POINT: Use the easier swims for a technique review. Check length of stroke, count strokes – maintain an even count as the pace increases. TEACHING POINT: BP3.2 means take a breath after a 3rd stroke then a 2nd stroke. This keeps the breathing to both sides but is not quite so taxing as pure bilateral breathing. TEACHING POINT: A firmer catch and pull, coupled with a better leg kick creates economical speed, not more inefficient strokes. 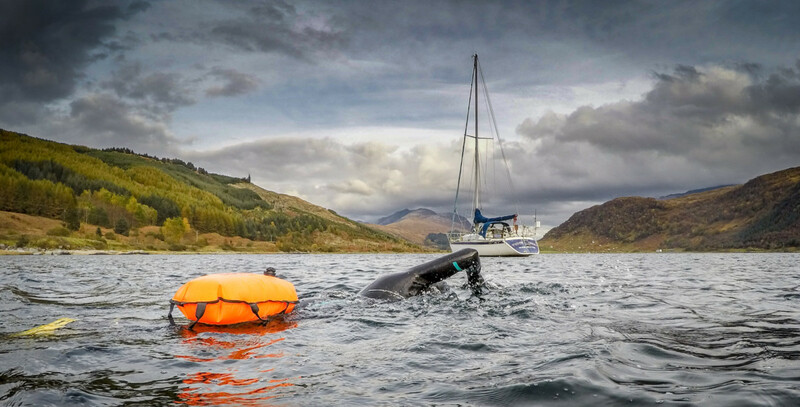 Make Your Pull Buoy part of your swim training, not your swim technique. These two pieces of kit probably create more debate in the world of Triathlon than any other. 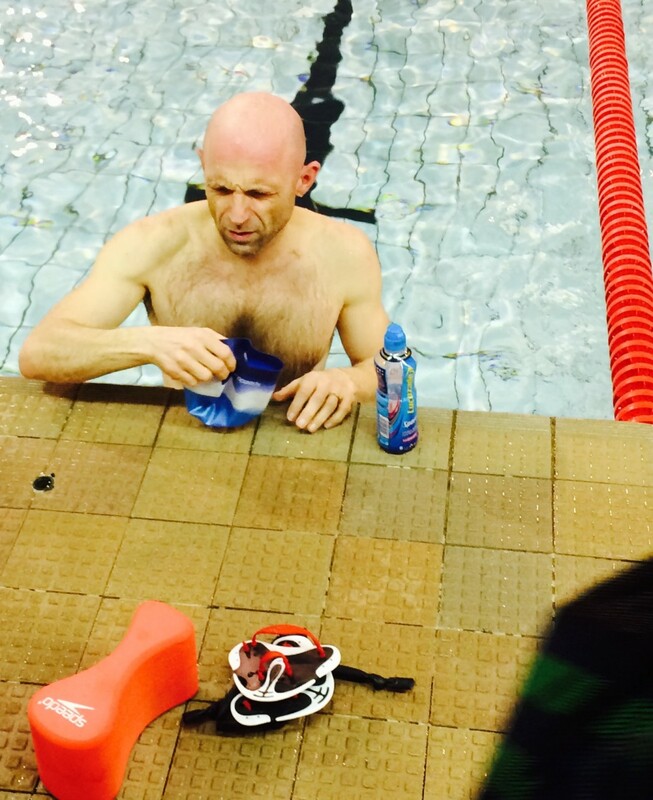 ‘I need my legs for the bike and run, why would I use them in the swim?’ I hear that a lot. Also. ‘My legs are tired from a bike session this morning; can I use my Pull buoy?’ The way I see it, yes we need the legs for the bike and run but to overload the arms in a race will equally leave you quite drained. Try to pull a long distance FC swim and despite the arms creating more effective levers at a lower energy cost, if they work too hard they can elevate the heart rate. You definitely don’t want a bad kick working hard, that definitely will leave you tired on the bike. I like the idea of the whole body contributing to a balanced body position and forward momentum so that no one particular area is working too hard. Things go wrong because it is so easy to get the kick wrong and create fatigue. On a daily basis during lessons I see people kicking badly creating drag and imbalance, using them to stabilise a poor body position. Most are horrified when we play back their video and they see the scale of the kick. 99% admit they had no idea their leg kick was so big. 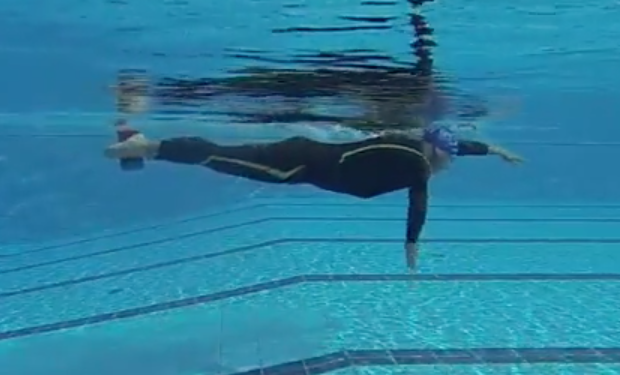 A good, narrow, streamlined kick within the full stroke FC should not fatigue you a great deal. Legs only for 25m will probably exhaust most and should not really be the measure of whether you spend the rest of your swim career with a Pull buoy between your legs. My advice? 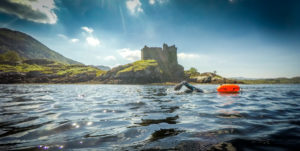 make Your Pull Buoy part of your swim training, don’t let it become your swim technique. If you are tired from an earlier run or bike then ok, perform more pulling but don’t become dependent on it. Better still I would prefer you in a Swimthin Wetsuit giving a slight amount of added buoyancy to make your swim easier but still allowing you to perform the full stroke. Most senior coaches in the world of pure swimming put a limit of about 20% swim accessory usage into a swim session. I would say given how Triathlon is a sport of 3 disciplines and invariably due to constraints on pool time we need some more flexibility with this as most will always arrive at the pool tired. With the pull buoy up between the thighs it is still possible to work the Hamstrings and kick from the knee. Many do this oblivious to drag and extra work being done. Occasionally mix up the pull buoy position and place it between the ankles (still with toes pointed backwards and not to the bottom of the pool) so that the legs really cannot kick. Adding a band around the ankles stops the legs kicking but if you rely on this too much you will never get to learn a correct leg movement. With a Pull buoy at the ankles you get the core engaged far more as you work to keep the hips up through focusing on your body position. There are also some nice movements from the world of Pilates and Yoga that can help learn the correct swim kick movements. Whether on Dryland or in the water, it all helps to overwrite a bad leg kick position and ingrain a new one. Be careful of using both Pull buoy and Paddles too much though. I have heard how Top Age Group Triathletes in an attempt to hurry their swim development have been left confused when being tested on their bikes in the wind tunnel. As a result of too much time with both paddles and pull buoy, extra drag had been created since the last test leaving the experts confused as to where this had come from. Due to a lot of pulling with large paddles shoulder size had actually increased messing with their bike position and aero position. When you’re putting in the hours with your swimming lessons, you really want to make sure that you’re doing the things in and out of the water that are going to make the biggest impact on your technique. 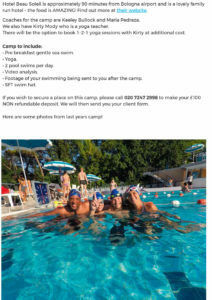 Learning the secrets to stroke development and upping your swim fitness in our swim coaching classes is all good stuff. But when you put in the effort during the rest of the week as well, you really do start to see amazing results that take your technique even further. At our Swim For Tri classes we really love watching our students improve over a course of 1 2 1 lessons. It’s all about the hard work and dedication, and the progress you see when swimmers finally head out for open water swimming speaks for itself. Based on some of the attributes we’ve noticed in our most improved swim students over the years, here is our top ten list of practical tips and winning attitudes that help you get the most out of your swim coaching. If you’re going to do something then do it properly, and advancing your swim technique is no exception! Arriving on time really is crucial. Not just so you’re not wasting your money and enjoying a full class, but also if you make a point of arriving a little early it really helps you to get your head in the game. When you arrive in good time you’re in a much more relaxed mental place, which means you can really work on your stroke technique and enjoy an unhurried class. Park the day’s stress in the locker room, and take a moment just to breathe and collect yourself. This will help you focus on your swim more. The thing about goggles is that they always seem to break just when you need them. We would highly recommend having some spare ones kicking around at the bottom of your gym bag so you don’t have to waste a session if the worst happens. Time and time again we see incredible results from our students who commit to doing their homework, and do it regularly. 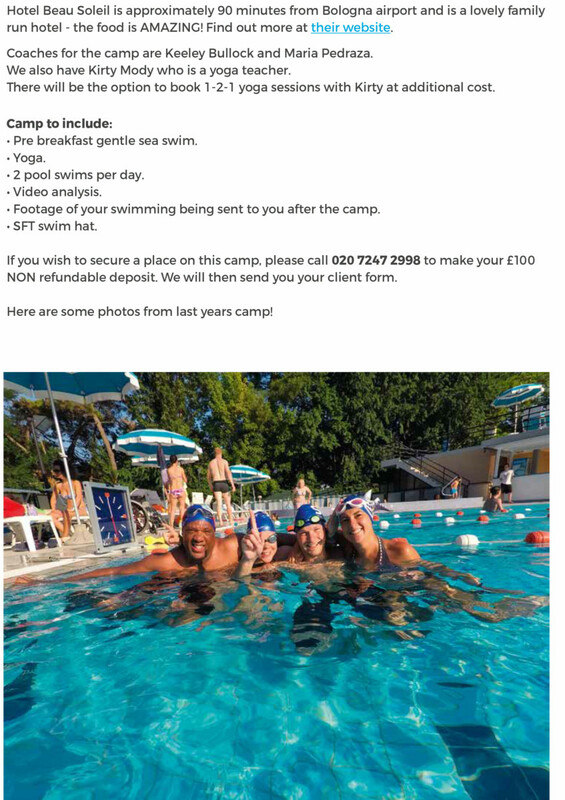 When you’re paying for swim coaching you’re often booked in for just 1 swim per week, which means you have 6 days out of your week unlearning how to swim. Beat this formula by keeping your head in the game even when you’re not in the water, and get the homework set by your swim coach done and dusted. Perhaps we would say this, but you should always listen to your coach and avoid overanalysing and complicating your practice with an onslaught of swimming technique information from Youtube or elsewhere on the internet. A professional coach will be drawing on years of experience as well as real life knowledge of you to give you personalised advice, so sometimes it’s best to trust in your coach and follow their advice to the letter. Don’t be a lazy swimmer! Try not to glide in to the pool edge, or stop early. When you think about all the swimming distance you’re skipping out on by cutting corners it really does add up over a year, so swim your full lengths and make the most out of your time in the pool. Start each one of your lengths in the pool with a really well executed streamline to set up an accurate length of swimming. It’s worth getting this piece of technique right to benefit your swim in the long run. When you’re learning something new it can feel like an uphill struggle at times, but keeping a positive attitude in mind means that putting in the effort it takes to vastly improve will be a lot easier. Remember that you can always improve – everyone can – but it will take some time. Be realistic and be prepared to put in the work to get to where you want to. 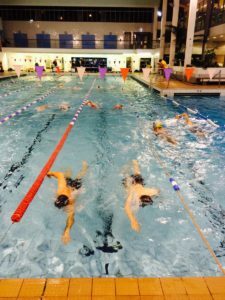 Improving your swimming technique is like learning a language or a musical instrument – the more time you put in the faster you will improve. Time invested wisely with good instruction from a great swim coach will result in huge improvements. Think about the amount of driving lessons it took to pass your test, and then how much longer it takes to really relax as a driver. It’s all about the week in week out effort and commitment to really get the results you want to. Having a bit of focus in your mind regarding your swim practice is one of the best things you can do to make all of these different elements slot into place. Prepare yourself mentally for your swim coaching by arriving with plenty of time, keeping a positive attitude, and psychologically committing to the process of improvement. Keeping a clear head in the water and being in the moment will have huge benefits for your stroke technique too. Finally, our most important tip has got to be make sure you’re enjoying yourself! Remember to have fun with your swim journey. We’re much more likely to be disciplined and committed to physical activity practices we really enjoy, so make sure you’re appreciating how your body feels after a good swim and giving yourself a pat on the back for your achievements when you notice those improvements. Thank you for reading this blog post about getting the most out of your swim coaching, we hope you’re getting all that you can out of your swim sessions. The Swim Plateau, don’t get stuck with your swim development. At a recent workshop at Speedo HQ looking at some product development the conversation turned to what is good swim technique. Amongst the assembled group of designers, scientists and coaches it was not easy fully describing good technique. Each person had a view as to which component was more important. It was actually easier to describe bad technique and how if you slowly eliminated it one aspect at a time you would be left with something that could be described as good swim technique. The key words such as rhythm, graceful, relaxed, a lack of splash, a lack of effort, symmetry, propulsion and low levels of drag cropped up but all are quite vague descriptions. We know it when we see it. It is highly individual and we all have an idea as to how we define it when we see it. A level of skill is needed to take away the thought process and allow the sequence of swimming actions to unfold naturally without hesitation i.e. the coordination of the arms and legs, the timing of the breathing, applying just enough force to pull you through the water without slipping in the water. When a swimmer starts out improving their stroke what I see is a sequence of swimming movements slowly being constructed and processed hence the hesitations, the slow rigid movements of the body and the mechanical edge to the movements that seem to hold the swimmer back. The big problem for those who are not natural swimmers is the concept of the disparity between what they feel they are doing and what they are actually doing. Many swimmers once they see themselves swim still need further convincing that it is actually them up on screen. At our weekend workshops where the filming is displayed in a classroom setting shortly after the first swim often swimmers wait to claim their piece of footage i.e. they wait to see if they like it. If it’s wrong and they have identified the wrong person up on the screen hoping to claim a better swimmer I diplomatically point out ‘unfortunately sir you are the only gent in today’s group so that has to be you.’ To the dismay of the owner of the swimmer up on the screen, they eventually accept. If you come from a sporting background (from any other sport) and have good hand eye coordination and good proprioception skills then the new movements often come easier. The disparity is narrowed, as people seem to have a more accurate method of allowing them to visualise the movements they are making. I liken this to the idea of the ‘unconscious incompetence’ being the first of the Four Stages of Competence, a well-known Psychology model that describes how we learn a new skill. This carries some relevance to our swimmers’ journey but for them it is not so much that they are unaware of how some movements are being performed badly it is more that they cannot perceive their own movements so whether they are good or bad when they see them they don’t feel they are their own. The journey to unconscious competence where it all seems so easy is not so easy. I feel there are 3 key stages for an adult swimmer attempting to swim well and most Triathletes plateau in the second area not realising how much time in the water is needed to attain the third (I am trying hard to resist not using the expression enlightenment here!) The workshop at Speedo HQ touched on why swimming can be so challenging and when I thought about how many repetitions of a certain movement were needed for it to become automatic, for it to become unconscious and competent I had to agree that unfortunately there was going to be a degree of repetition to training. I swam 7million metres between 1987 and 1994; I would hope I could make it look relaxed and as if I am not trying. To be honest it should be better! I have done the thousands of movements needed to push the sequence of swimming movements into the subconscious so you no longer need to process them. How many hours at the steering wheel did you spend driving before you started to not notice the mechanics of the process of driving? I bet it took a while for some to be comfortable enough on the bike to stop looking for the gear and brake levers. The moment they become an extension of the hands and arms you can then focus on the road around you, the surroundings and traffic, suddenly you are a much safer cyclist. Feeling fast but swimming slow. Initially when people start out improving their swimming it is exhausting due to making use of the incorrect muscles (usually the larger ones of the legs) to perform incorrect movements. Getting tired more quickly then is necessary while directing yourself in a direction you don’t want to go is a double whammy of a problem. Unfortunately, the sensation of speed is apparent since it all feels so strong and fast, the bubbles, the splashing and the getting out of breath. The sensations that can deliver such speed on the bike and the run will do nothing but fatigue you in the water due to a lack of streamline, using the wrong muscles to channel water in the wrong directions and not allowing you a healthy window of opportunity to get your air in when breathing. Fortunately, it does not take too long to move on from this position. 4-5 lessons can do it for many people, acquiring the correct movements driven by many of the smaller muscles will soon have you moving into stage II. Feeling slow but getting faster. The Swim Plateau. Getting faster as the effort levels come down and streamline starts to kick in can happen quite quickly. At this stage, you are unlikely to be purely swimming faster but for longer distances you should be setting improved times as you fatigue less. Often the big issue at this time is convincing swimmers that they are indeed getting faster. Due to the counter, intuitive nature of faster swimming becoming possible with less effort many people refuse to buy into it. ‘This can’t be right,’ ‘Its too easy.’ Constant measuring will help reassure you, whether it is time taken for a distance, strokes taken or distance swum in a certain time. Be fair and time yourself over at least 400m though, a 25m sprint will unlikely to be quicker as you will not be swimming faster in terms of pure swim velocity. 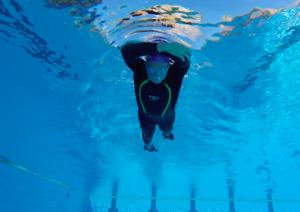 You will still be processing a sequence of swimming movements to create the FC stroke but the direction you channel water will be positive in terms of you moving forwards. You will generally be taught to use the smaller muscle groups to control smaller movements. The energy and Oxygen cost per stroke will reduce massively. Linked to the counter intuitive feel unfortunately, is that these new muscles are not yet familiar with the new movements so for 6-8 weeks even smaller muscles (now moving correctly) will be more tiring until they adapt to the new overload. Most will now be in that tricky in between stage where you are not reaping the benefits of being faster just yet (more on this later) but since your movements are now contributing to going forwards rather then up and down or sideways, faster times are inevitable if you believe and persevere. Swimming Fast and Feeling Fast. Finally, we come to the moment of enlightenment (sorry!) when you feel fast in the water and you are actually moving fast in the water. Swimming fast with the sensation of speed is a combination of a well streamlined body position, a rhythmical leg kick to hold you in the water and assist your body position, constant rotation to the degree you are streamlined but not overdoing it and wasting time gliding. Probably the key benefit is acquiring the feel for the water, at this point you make the water feel more solid around the hand. You can feel the body moving over a stationary hand rather then it slipping under the body meaning more strokes are needed to move at similar speeds. A secondary part of the feel for the water is how you can then sense just how much effort to put into each pulling movement. Too much strength and it is wasted as the fluid water slips around the hand, not enough and you just move slowly. A strong pull is a combined balance of strength and finesse allowing the maximum amount of effort to be deployed. 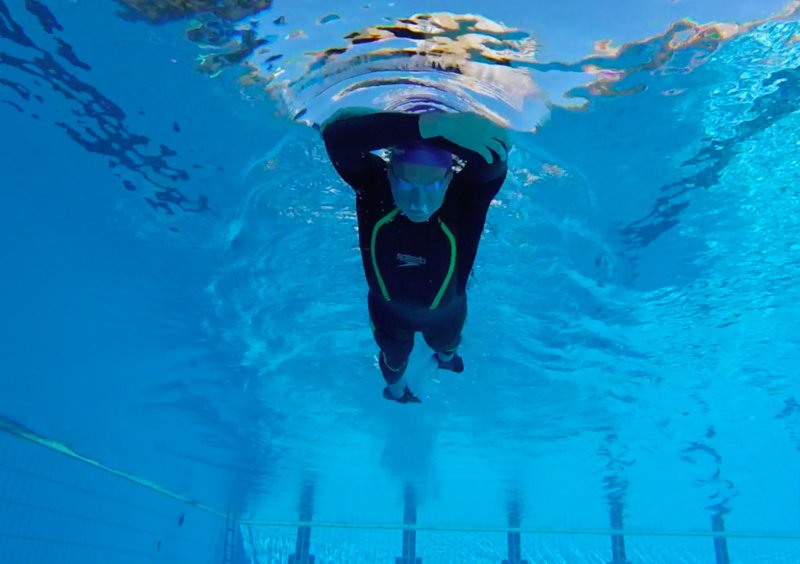 The faster you move through the water then you will add additional benefits such as the trough of air deepening around the head meaning you can turn the head less when breathing. Sitting higher in the water carries benefits to the sighting process and so on. At this point you will automatically process the FC movements without the thought process meaning you can focus more on pacing and race tactics but it is going to take quite some time to acquire that degree of unconscious competency. For some this may take a while longer then they hoped but it is possible. You may need to think in terms of sessions per month rather then sessions per week. What I mean by this is that aiming for 4 sessions per week is a noble ambition but you are more likely to be content with 3 out of the 4 actually attended. If you aim for 13 from 16 per month you will be getting more achieved and hopefully be inspired to achieve more. Set realistic goals and think about it being a 2-year process if you are starting out from a novice level. Acquiring a technically proficient stroke will enable you to be faster, swim easier, prone to fewer injuries and eventually allow you to enjoy the swim aspect of your race. i.e. the pacing, the tactics and the actual racing rather then just mechanically processing the swim movements to help you survive from start to T1 and allow you to start your race sooner then just when the Bike starts.